Promoting better workers’ rights is an essential part of the Rainforest Alliance program, as we believe that a sustainable agricultural sector means workers are paid a living wage. That’s why we require that farmers make progress towards paying a living wage to workers they hire on their farms. A living wage is defined as enough to afford a decent standard of living for a worker and their family. However, we recognize that there are barriers to achieving this, largely because of the global conditions of poverty and the costs farmers must absorb in increasing wages of a work force. This means we must work with companies, producers, governments and NGOs to take the necessary steps towards achieving this. 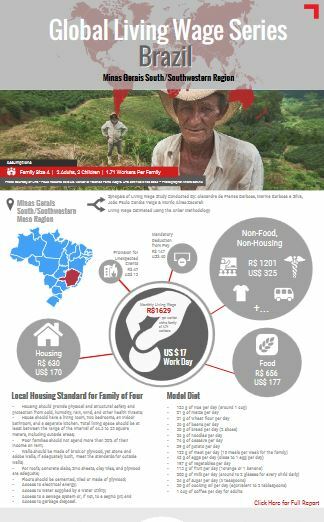 Click to view the entire benchmark infographic for Minas Gerais, Brazil. The Rainforest Alliance, including its UTZ certification program, includes mandatory requirements to identify the current gap of wages against a Living Wage benchmark. We require continuous improvements on farms in moving worker compensation towards living wage levels. In some cases, the living wage is 100% higher than the country’s minimum wage. A step-by-step approach is necessary in order to drive change while also ensuring that farms remain economically viable and stable. In addition, it is important to complement wage requirements in our standards with active discussion with all actors in the supply chain to raise awareness of the need for a living wage and the steps each has to play in achieving it. One of the barriers to determining living wage is the gap between current wages and a living wage can be very wide, making is difficult for producers to absorb the added costs of production without going out of business. Another barrier has been the lack of a global definition of what a living wage actually is and how to calculate it. To address this, both UTZ and the Rainforest Alliance were founding members of the Global Living Wage Coalition; a group of standard setting organizations that are working with two leading, independent researchers. It is of course very challenging to address a concept that is not well defined. In the past four years, the GLWC has addressed this issue by providing scientific knowledge on the Living Wage concept. The coalition believes that calculating and publishing benchmarks is a catalysis for further action towards achieving wages that will enable workers to escape poverty. One of the ways to support a living wage is to address the low minimum wage levels in the countries where the Rainforest Alliance works. In some countries, minimum wage is often set well below the level that allows workers to have a decent standard of living. To that end, we are partnering with the International Labor Organization (ILO) to develop methodologies that will empower governments and other stakeholders to negotiate and set adequate wage levels, taking into consideration the needs of the workers and their families, as well as the economic factors of supply chains. It is not an easy fix because of the context of poverty we operate in and a globalized economy that requires all actors in the supply chain to remain competitive. It is more effective to call for a progressive reduction in the gap between minimum wage and living wage, and to empower workers to self-negotiate better wages. Progress must be one step at a time. It does not benefit workers if farms and producers are forced to drop out of certification or sustainability programs because increased wages for an entire work force would put them out of business. 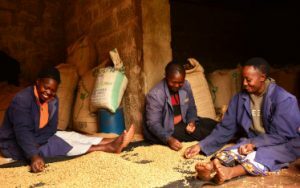 The Rainforest Alliance believes that sustainability is a journey of many steps and certification is just one tool among others that can help farmers achieve and maintain sustainable livelihoods. Certification programs cannot guarantee 100% compliance on all farms at all times. However, we are committed to continuously and proactively improve our systems to make them adaptable to the changing global realities. Now more than ever, there is more pressure on producers and companies to do their part in eliminating global poverty. The United Nations Sustainable Development Goals aim to eradicate poverty by the year 2030 and ensure a decent work agenda which includes a living wage. Resolving the challenge of paying a living wage requires commitment from all stakeholders. Governments can strengthen wage policies and support producers in achieving sustainable livelihoods for themselves and their workers. Companies can increase their investments in sustainability programs. And the power of consumer demand cannot be underestimated – your consumers can help by choosing certified products and telling you, their favorite brand that they value your role in contributing to a sustainable future. Read more about what the Rainforest Alliance is doing to foster a decent standard of living for all here.